Chocolate therapy can come in many forms. Aside from unwrapping a bar and taking a bite, I find that baking with chocolate is a form of therapy in itself. When things are a little crazy, I find all is right with the world when I fall back on making chocolate desserts. Thank goodness for chocolate! With the kitchen mishaps I'd been having, I reached for one of my trusted sources for good recipes and dug into David Lebovitz's The Great Book of Chocolate for inspiration. 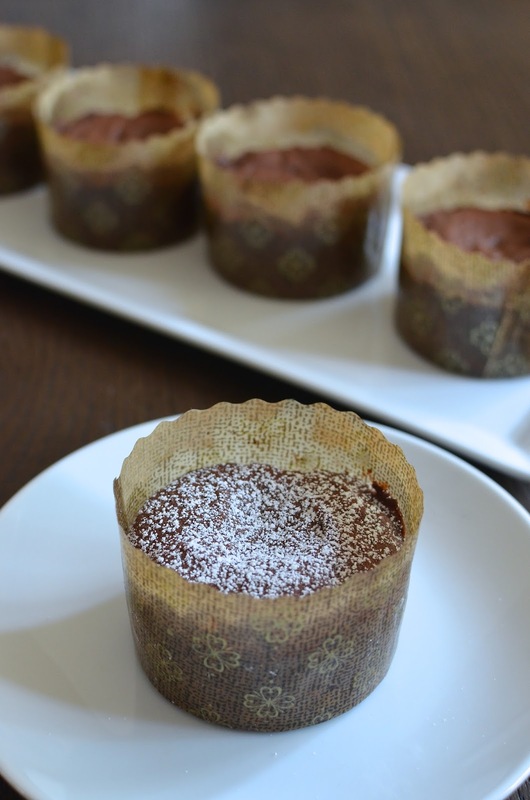 I decided to make bouchons, or what I think are best described as small brownie-like cakes. When I think of bouchons, I think of Bouchon Bakery; I've had their signature chocolate bouchons and they are little cakes, shaped like a "bouchon", which means "cork" in French. I've always wanted to make bouchons because any chocolate lover welcomes the chance to make/eat a chocolaty, fudgy, brownie-like cake. I always figured I had to get the little bouchon mold for the job but I finally realized I could just bake them in a regular or mini muffin tin - or better yet...make somewhat larger - yet still mini - cakes using individual paper molds. So I made the chocolate bouchon batter and baked a few in individual freestanding paper molds. These molds make great single-serve portions. They un-mold perfectly and you have a lovely little chocolate cake to serve each person. Much like brownies, it's important not to overbake these cakes. They should be soft inside, revealing a moist middle when you dig into it. These cakes are solid - hearty and rich chocolate cakes that are a little crumbly and a whole lot chocolaty. We're talking chocolate cake batter made with dark as well as unsweetened chocolate and some mini chocolate chips thrown in to drive the point home. I think this will satisfy any chocolate lover's craving. And I can tell you that if there's anything better than baking with chocolate, it is eating chocolate (or chocolate cake). I think we should all work this into our summer schedule. Are you ready to make these? If you don't have the small individual paper molds I used, feel free to bake them in a muffin tin. Plan on getting 12 regular-size muffin cakes out of the full recipe. I made half a recipe and baked 5 small cakes using the paper molds. As you can see, the batter is a rich, thick one. There's no leavening so what lift you get comes from the eggs. Watch the cakes carefully towards the end of baking to avoid over-baking them. They're ready to come out when the cakes are dry and set on top but feel soft in the middle when you touch them. If you like, take a cake tester and insert it in the middle. It should come out a bit moist (bearing in mind there's some mini chocolate chips in the batter), not totally dry. The cakes taste best the day they were baked but I think that baking/keeping the cakes in the paper molds helps with freshness. If serving the next day, I like to warm the cakes in the microwave for 15 seconds or so first. 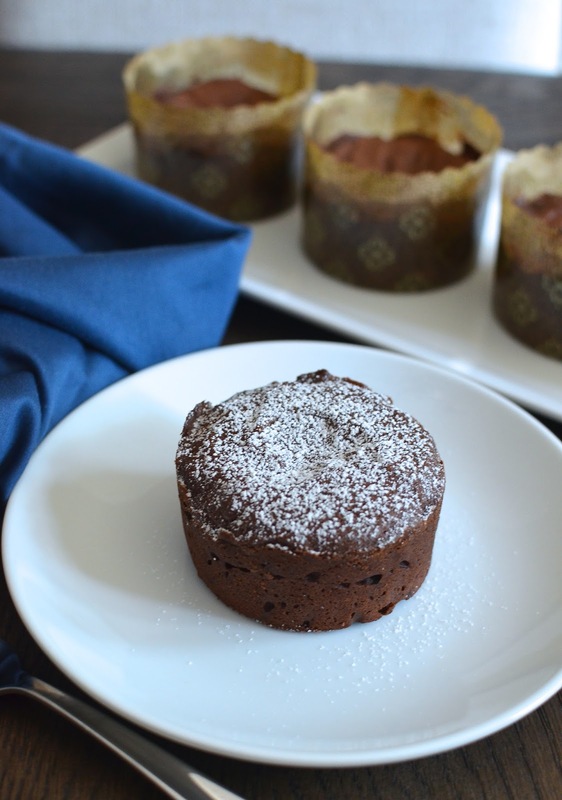 It tastes like a mix of all the wonderful chocolate desserts we chocolate-lovers adore - it's a little bit brownie, somewhat like a dense souffle cake, or a heftier molten chocolate cake. What's not to love about all that! In a heatproof bowl set over a pan of simmering water, melt the chocolates with the espresso powder, if using. In the bowl of an electric mixer, beat butter and sugar until very light and fluffy. Add eggs, one at a time, mixing well after each. Scrape the bottom and sides of the pan, as needed. Mix in the melted chocolate. Whisk (or sift) together the flour, cocoa powder, and salt. Stir the dry ingredients into the batter in 3 installments, using a large rubber spatula. Stir in the mini chocolate chips. Divide batter (it will be relatively thick) among the muffin cups (or paper molds). Bake for approximately 16-18 minutes, or until the cakes are set and dry to the touch but still quite soft in the center. Do not overbake. If you insert a cake tester into the center of the cake, you should see moist crumbs. Remove from the oven, let cool 10 minutes before removing from the muffin tins. Plate and dust with confectioners' sugar before serving. wow..I am in love with that moist, perfectly dense texture. Well done, Monica. That's exactly it...very rich and satisfying. I so agree with the therapeutic part! There's something so satisfying to watch solid chocolate melt into a molten liquid! These bouchons look SOOO good!!!! I need to get my hands on this cookbook! Looks amazing! Definitely agree with you on that. Baking in the kitchen, turning out cookies, cakes, muffins - it's a little bit of bliss. 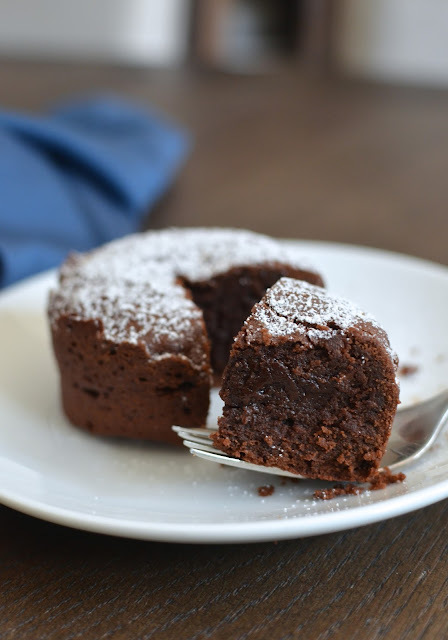 Brownies are my all time favorite dessert, so these are the perfect little cakes for me. The texture in the middle looks amazing! I do love brownies! I was very grateful I didn't over-bake the cakes and got that truffle-like center. Thanks, Christin. So true, baking with chocolate is a form of therapy in itself! 'Bouchon cake' is so a new name to me. Absolutely loving the texture and shape and these wonderful brownies! YUM! I don't think I ever heard of these before but all I know is I WANT ONE! Monica these little cakes really speak to me. Chocolate is very therapeutic - and baking with chocolate always sets my mood right. That moist center is a thing of beauty and it looks like you baked them perfectly. I truly understand about having a series of failures in the kitchen, they seem to come in batches for me too. I have a bunch of those little paper cups purchased on clearance and am always looking for ways to use them. Thanks for the lovely recipe and I hope your summer is going well. I sometimes say that I want to be a chocolatier in my next life. ; ) Thanks so much for the sweet words...hope you're enjoying the weekend! I agree chocolate is therapeutic. It work wonders to lift your spirits and relive stress. I am not familiar with bouchons but I must say they look and sound utterly delicious! Growing up as a child I did not like chocolate, pretty crazy right? Now I love it, my sister says I am making up for lost time. Beautiful little cakes that look perfectly baked, you are an amazing baker. It is crazy! Just kidding, Cheri! ; ) I'm glad you're making up for lost time. For me, it was all about chocolate ever since I can remember. Thank you as always for the sweet words. These bouchons have my name written all over them!